Just in time for Halloween, our good friend Justin Zimmerman has an interview featured on ComicMonsters.com: The Making of The Killing Jar. It’s an excellent look at the process of this talented horror author and filmmaker as he breaks down his scripts and gets into the dark places of our medium, with the help of his accomplices Russell Brown and Tom Jacobs. 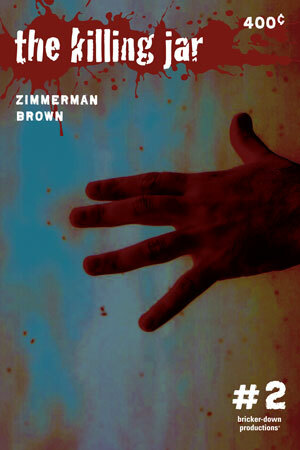 Issues 1 and 2 of The Killing Jar already available, and the 2009 Killing Jar Annual about to be released any day! Check out the Bricker-Down Productions page in the ComiXpress Store for all of Justin’s offerings. ComiXpress: As Seen on TV! Well, Cerebus TV that is! At 10pm on Friday October 23rd, Dave Sim’s new project Cerebus TV launched. Approaching internet video with a focus on the indie and self-publishing comics industry, delivered in a short-news-clip CNN style, Episode 1 featured an introduction by Dave Sim as he outlined the state of the Indie Comic Nation and where we as a community stand with Distribution today. We highly recommend that you visit Cerebus TV to see the video in its entirety, but for now, here’s a segment of Cerebus TV Episode 1 featuring a particular grey-haired comic book printer as he introduces the viewer to what ComiXpress is all about. Dave Sim’s Cerebus Archive comes to ComiXpress! And lo, in the hazy grey mists of a New Jersey Autumn evening, the legendary Earthpig tread wearily from the 70s into the halls of ComiXpress, and found a welcoming hearth. It is with great pride that I make this post. As a lifetime fan and reader of indie comics, Dave Sim’s Cerebus always had a special place for me. The depth of the story, the wry wit and social commentary, the brilliant art of the book … this was the reason I read comics. As an aspiring cartoonist, I admired Dave’s championing of Creator’s Rights and his groundbreaking work in Self-Publishing. This guy’s day didn’t end when he put down his pencil after knocking out a page; he effortlessly changed hats from creator to businessman, showing a generation of cartoonists how it could be done if you had the brains and the guts, and in many ways made the independent comic book explosion of the 80s possible. That inspiration is a big part of what drove me to create a company in 2004 that changed the way indie comics were made. And I couldn’t be more excited that Dave Sim has brought his work to ComiXpress. Starting today, with the premier of Cerebus Archive #4, you will always be able to order every back issue of Cerebus Archive, Dave’s black & white walk down memory lane (completely devoid of rose-colored-glasses). No back issues ever go out of stock at ComiXpress, and Comic Shop Retailers are a welcome addition to this new Direct Market with a book from one of the most respected names in comics who has proven time and again how seriously he treats deadlines and release dates. 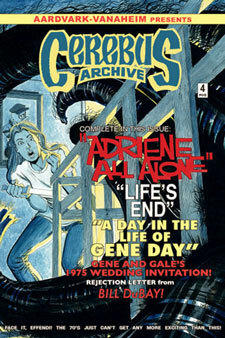 So please, join me in welcoming Dave Sim, Aardvark-Vanaheim, and of course Cerebus himself to ComiXpress. And lets all look forward to a brighter future for indie comics together. Happy Monday, and welcome to the all new ComiXpress! Pardon our dust as we continue to roll out all of the new features. Feed, and you’ll soon be able to Friend us on MySpace. Creators and Readers, Retailers and Comic Lovers of every stripe – welcome to the NEW ComiXpress! Since I first took my background in digital printing and put it to good use by printing my own comics way back in 2003. … Since I started printing my friends and associates comics in small, affordable batches as they had the need for them. … Since I said to myself, “Y’know, Self, there are a lot of other cartoonists who could benefit from something like this … maybe we should put together a website …” in the early days of 2004. … Since the LAST time the indie comics family as a whole sat up and said, “Wait … what? You can DO it like that?”. … Since then, every day has been just another step on the road to Today. Today, in an atmosphere where indie, self-publishing and small press comic creators find themselves facing new hurdles in getting their work into the hands of their readers. … Today, as indie-friendly comic shops find their options limited to more “mainstream tastes” despite their unswerving desire to support the creative spark they recognize as the life blood of our beloved industry. … Today, when options seem fewer than ever, there IS an alternative. By combining the unprecedented flexibility that print on demand offers, indie comic creators can easily supply indie-friendly comic shops with their books. No print overruns, no back issue shortages. Stores can now order any quantity of any book in an ever-growing online catalog of incredible indie comics, and have those books on their shelves inside of a week. And we here at ComiXpress couldn’t be more proud to be at the forefront of this new era of indie comics once again.